Brilliant! The old interface doesn’t compare. Very nice! I really like the “submit article” feature. Maybe add tools to it. Thanks for the update. Just tried the new interface, looks very promising and should help me get to the tools I use more efficiently. The interface is really easy to use. It feels familiar because it is like my igoogle home page. I immediately changed my theme to red because it’s a company colour and I put the submit new article right to the top. I love the new interface, especially being able to move things around easily, have so much info on the home page and the new themes … brilliant! Looks good but a script crashed my web browser. I’m using Crazy Browser (IE platform) on Window XP. Very interesting, but takes time to learn for me. Looks fabulous, Thank You for going the extra mile for your clients. I think it would be great advantage for us as we are article writer. Congrats on making this new edition. It’s feel like WordPress Admin like functionality, which I love. I like the new interface because it made things so easy to use and move around. If it mean anything at all, it indicates that you care. A blessed evening to everyone/ my EzineArticles community! Thank You for going the extra mile for your clients. I’m using Crazy Browser (IE platform) on Window XP. This is great!! I particularly like being able to remove items that I do not use, knowing that they may be added back in later, if I so choose. Well done guys!! Very nice ! It made me to have more interest in writing article. I really liked the new look. Very easy to customize. I added the “Recent Article Activity” item, which I like the best. 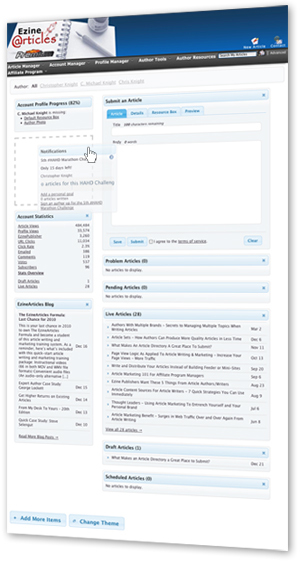 At a glance you can make out the activity on your articles. Thanks for providing us the new features. Love the new proposed site. A make-over was very much needed. Keep it up! We can only expect the best from the number one article directory named EzineArticles.com . This is another step forward in their great journey. The new site looks great. Nice overhaul. Looking forward to using it. I like the new interface!!! The new widgetized member interface is great and user friendly. Job well done. Awesome! I love how you changed the area that you write your articles in–so much easier. I also love all the data analysis. It’s simple and really easy to use. Thanks EzineArticles. It’s definitely a wonderful Christmas Gift. The new beta site looks like it will be easier to use. I will keep it here. Thanks. Anything that helps us struggling authors is greatly appreciated.